Little is known about one of the most notorious pirates of the early 18th century. Blackbeard’s real name may have been Edward Teach and he was born about 1680, possibly at Bristol, England. He went to sea when still young and served during the War of the Spanish Succession. It was after the war ended in 1713 that Blackbeard turned to piracy. Refusing a royal pardon, he took over a ship, Le Concorde that had belonged to fellow pirate, Benjamin Hornigold. Blackbeard renamed it Queen Anne’s Revenge. Despite reports of Blackbeard stealing food, liquor, water supplies, weaponry and valuables from other ships, there are no accounts of him killing anyone. Terrorizing his crew was another matter. One tale has him shooting his first mate: “If I don’t shoot one or two crewmen now and then, they’d forget who I am.” Another has him locking the crew and himself below decks and starting a fire to see how long they could survive. Blackbeard was the last to emerge, roaring: “Damn ye, ye yellow-bellied sapsuckers! I’m a better man than all ye milksops put together!” In May 1718 Blackbeard sailed with four ships into the mouth of Charleston harbour in South Carolina. He blockaded the harbour, robbing any ship that tried to enter or leave. Blackbeard held one crew ransom for a chest of medicines and when it was delivered he released his hostages, minus their clothes. Shortly after making good his escape, Blackbeard scuttled two of his own ships at Topsail Inlet. Views vary as to whether this was an accident or a deliberate attempt to downsize his crew and outlay. In 1718 Blackbeard was pardoned at Bath, North Carolina, and retired to live off his ill-gotten gain. However, Governor Alexander Spotswood of Virginia did not believe that Blackbeard’s retirement was genuine. He hired Lieutenant Robert Maynard £100 to kill Blackbeard. On 21 November Maynard and his men discovered Blackbeard and his crew in a North Carolina inlet. Early the next morning, Maynard began to chase Blackbeard and a battle ensued. 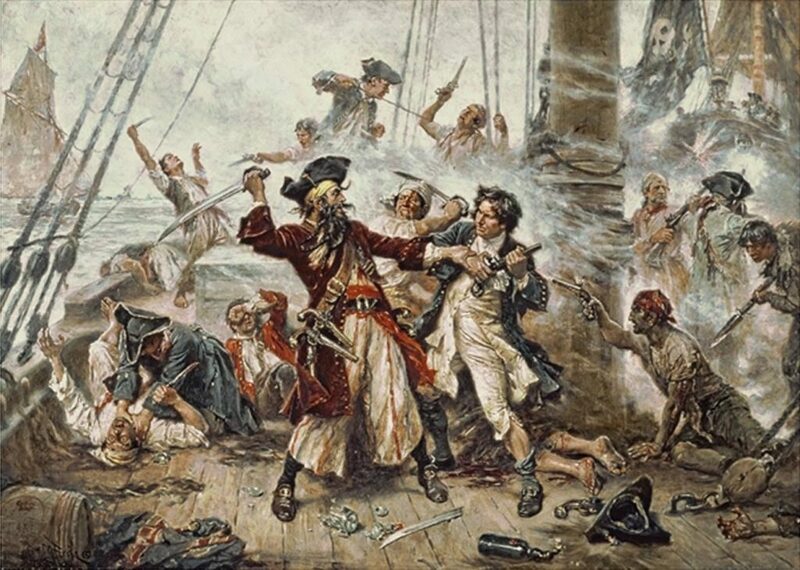 Blackbeard and Maynard engaged in hand-to-hand combat and Maynard shot the pirate. He was supposedly shot five times and stabbed more than 20 before he died from blood loss. Maynard then cut off his head and hung it from his bow. It was then placed on a pike on the north shore of the Hampton River in Virginia, at a place now called Teach’s Point. Legend has it that when Blackbeard’s headless body was thrown overboard it swam seven times around his ship before sinking.